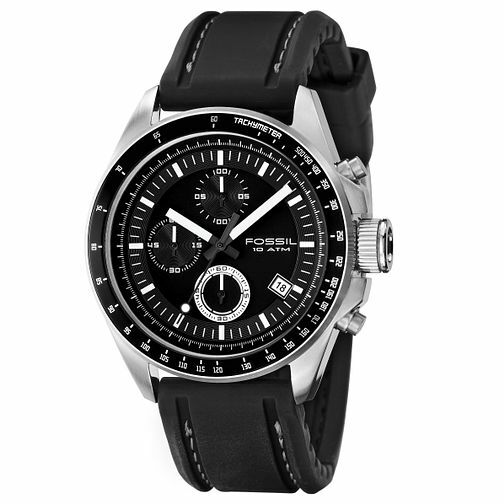 Fossil Decker men's chronograph watch with round black dial and black rubber strap. Fossil Men's Black Rubber Strap Watch is rated 5.0 out of 5 by 1. Rated 5 out of 5 by Anonymous from Brilliant watch! I was looking for an uncomplicated, easy to read watch at an affordable price. I have had much more expensive watches in the past that are not as well made or as tough as this one and it also looks great. The customer service in the store was also excellent as well. I would definitely buy another Fossil watch in the future. Thanks very much.